Elvis Impersonator. Elvis tribute singer. Elvis Presley tribute artist. It seems Elvis Presley is still alive and kicking. We have got some amazing Elvis tribute singers in South Africa. They rock as entertainers and look just like Elvis Presley himself. Blink twice and you will swear that you are watching and listening to the real Elvis Presley live. Some of our comedy bands also do work as Elvis impersonators, and then we have specialist Elvis Impersonators. Singing all of the classics: Jailhouse rock, Blue Suede Shoes, Love me tender, I can't help falling in love, and many more. Our Elvis impersonators are perfect for corporate functions. 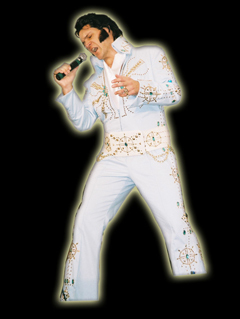 Rock the night away with an Elvis tribute singer and entertainer. Book an Elvis Tribute Singer and Elvis Impersonator Now.